In the English language there are over 170,000 words. The hardest word to try and define in my opinion is “normal”. When you’re raised at the most remote fishing lodge in Alaska your definition of “normal” deviates a bit from what most people would call “normal”. Bears breaking into your home, sinking a new well at 9:00 at night while the sun is still blazing in the sky, catching 100 salmon in a day and visiting with people from all over the world could all occur on the same day and to myself & my sister that was well…….“normal”. 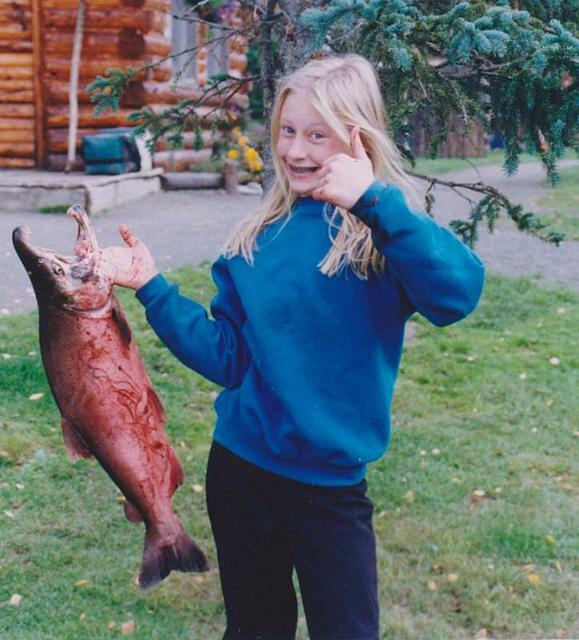 My sister Alyson happy with her Anvik River salmon that she caught. My family started running Alaska’s Anvik River Lodge in the very late 1900’s. 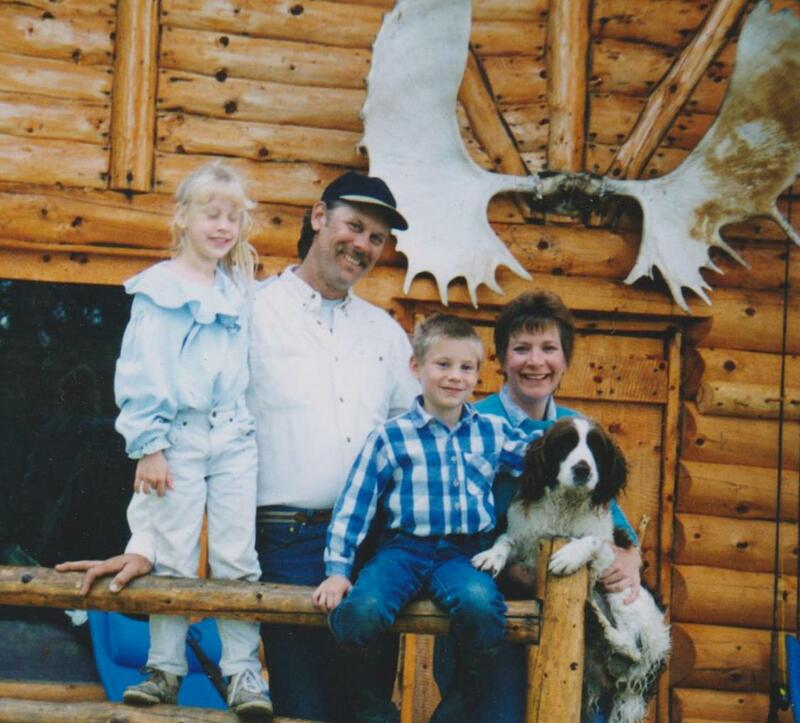 At the time we were living in the bush Alaska community of Bethel. Within a couple of years of acquiring the lodge my folks decided to up root for the winter months and go to my father’s home state of Florida. It was more out of necessity than choice. In the mid 90’s the internet was marginal at best in bush Alaska and hadn’t taken off as strong as it had in other areas of the country. This along with the lack of conventional advertising resources and the major expense of traveling to sport shows and such made it incredibly difficult to market our new business from there. As a young kid, eight years old at the time, the transition from a rural Alaskan community where -70 degree wind chills and 18 hours of darkness was not uncommon in the winter, Florida was most definitely different. Basically Alyson and I felt like square pegs trying to fit into a round hole. My stories about my wilderness adventures or of our dog fighting grizzly bears or the necessity to often fly in small bush planes as a youngster would often be discarded as tall tales and few people would actually believe me, unless there were pictures. During the summers though life was pretty great. We worked – a lot. If I was strong enough to haul firewood I would have to do it. Just because we were small didn’t mean we got a free pass. Everyone worked, and I mean everyone. Rather than have a day at the park we would sometimes go out on the river and have a BBQ. Having fun on the Anvik River with Dad. Our “Fourth of July” celebrations were always something to look forward to. You see, we usually had paying guests at the lodge by then, so in order to have the time and energy to have some fun and create some memories just for us kids, my folks would schedule our “Fourth of July” celebration sometime before the 25th of June which was usually our opening day for the busy summer guest season. Heck, we didn’t know any different and it was a blast. Along with games such as ring toss, balloon popping and relay races that were set up we’d put on our own mini-parade. This parade would consist of Alyson and I getting dressed up in homemade costumes, ranging from Jimmy Buffet to Darth Vader for me and Little Mermaid to Superstar for Aly. We would use the garden carts for our “parade floats” and my dad and some of the guides would push our “floats” around the yard paths as we’d throw candy to the crowd, and by crowd I mean about 15 people. Many years several of our friends from Bethel would fly to the lodge in their float planes and join us for the festivities – we thought this was all very “normal”. 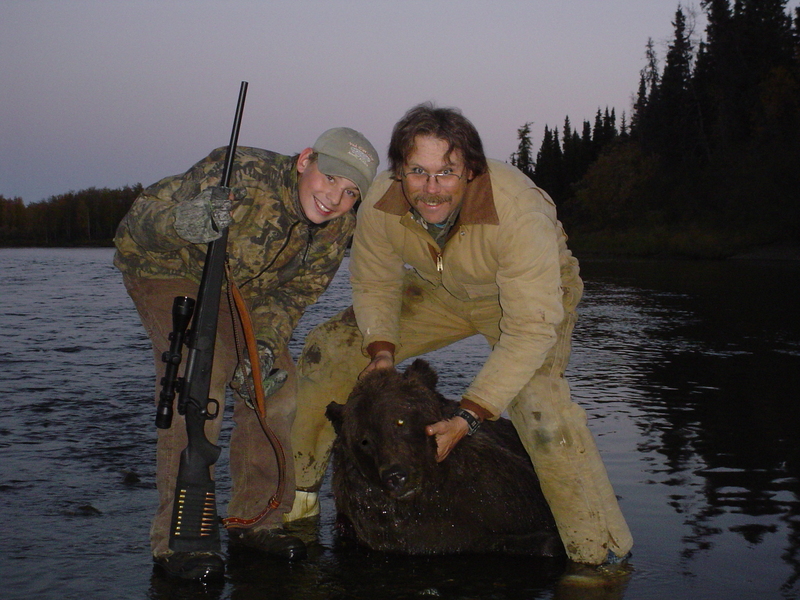 My first grizzly bear at age 13. As you can imagine as I got older, shop class for home-school was about as real as it got. Definitely unconventional. Of course there were lots of times when I was young that I definitely wanted to do anything other than weed the garden again, or fillet another salmon, or haul in more firewood or any of the other million daily chores that were necessary. But now I look back and appreciate and love what we do more and more. 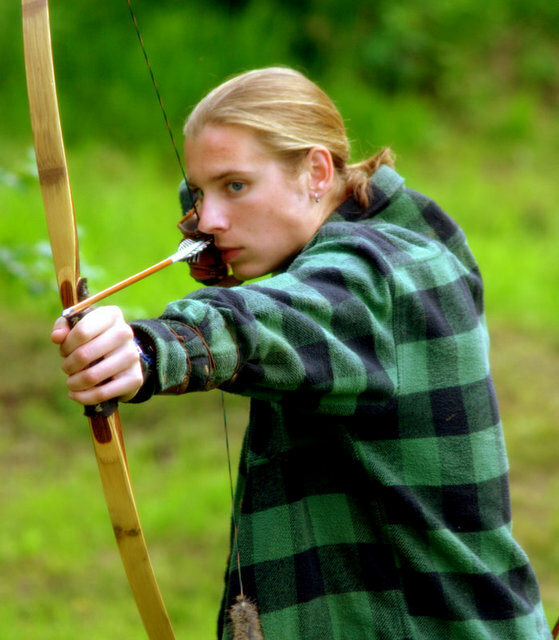 Me honing my skills as a long bow hunter at about 16 years old. At the time I never knew what it exactly was my parents were teaching me with all the skills and tasks we had to accomplish and develop. But now I think I get it. I learned things that I simply would never have had an opportunity to do if it were not for my parents and the lodge. 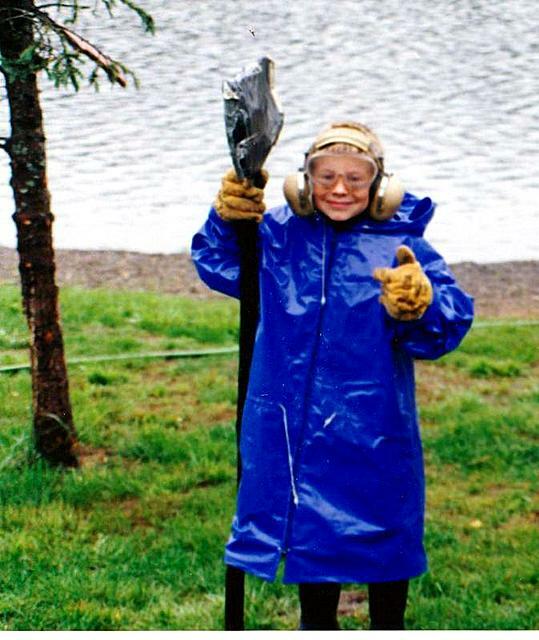 Growing up at the Alaska’s Anvik River Lodge was pretty awesome all-in-all. As the youngest person here for most of the time it was like having 7 big brothers and sisters as the crew. Most of these fine young people would take the time to indulge me in my childhood stories of slaying dragons and odd facts I had read in one of a hundred books I must’ve read. You see, we didn’t have any Playstation or Nintendo. No satellite television, and what internet connection we did have was reserved for the business and not entertainment. This was great but I never realized it until I got older. It caused my sister and I to make our own fun with what ever was available for entertainment. My “toys” of choice were usually a cardboard box, roll of duct tape, a piece of pvc pipe and some string. These things along with my imagination provided me with hours upon hours of entertainment. And when you’ve got time to read without the distraction of T.V. or other screens, one can develop a profound love of having that special time. Although, again, I didn’t realize how special that was at the time – just “normal”. We always made our own fun and usually our own toys. I will be the first to admit though that my lack of exposure to technology has made my learning curve on the whole computer thing a little steep, but those stories are best left for on the river. Another major benefit I was able to partake in during the transition from adolescence into adulthood (I cringe at that word) was the wisdom that so many guests have handed down to me over the years. Not only was I able to have engaging and stimulating conversations about everything from politics, business, and even cooking. I was also able to learn the lessons of lives much longer than mine. Simple things like how not to get in trouble and screw up your life to how you treat people. I feel to a point I was able to keep my nose clean avoid too many mistakes in life because of those little fireside chats over the years with the countless people who have impacted my life without ever knowing it. In today’s world it seems as if we are inundated with all of the bad things going on and what all the bad people are up to. We forget how many people are truly special and incredible out there. I get to see that everyday and in that I’m incredibly lucky. 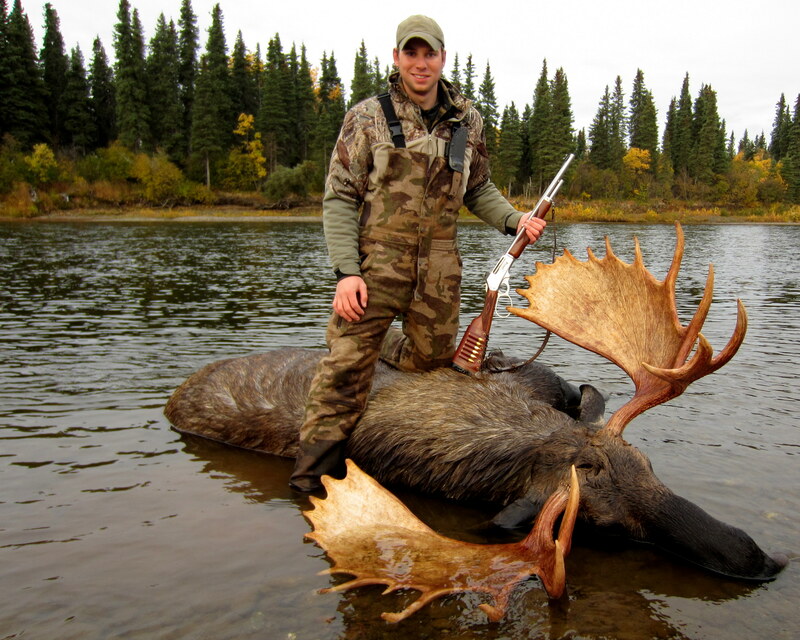 Years later on one of many moose hunts on the Anvik River. 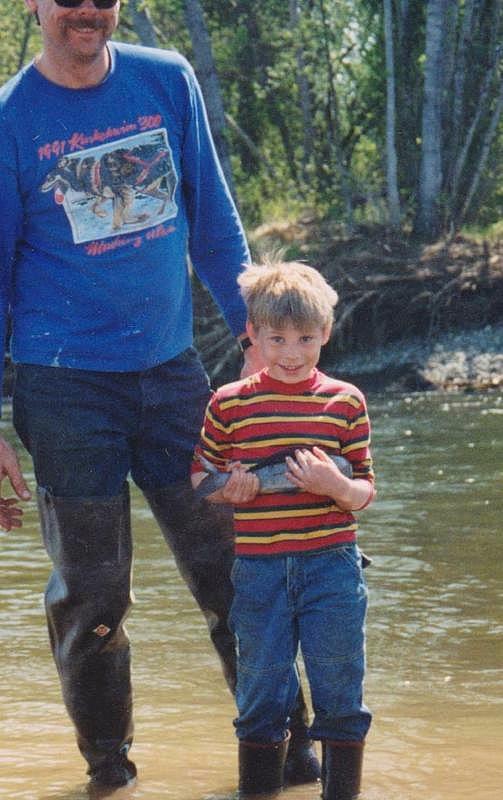 So from the time I was walking around the lodge in my onesie pajamas to now when I’m walking around inside the same walls in my waders getting ready to do a job I’d watched some of my heroes do for all those years I would say that its been an incredible life and I can’t wait to see what the future brings. 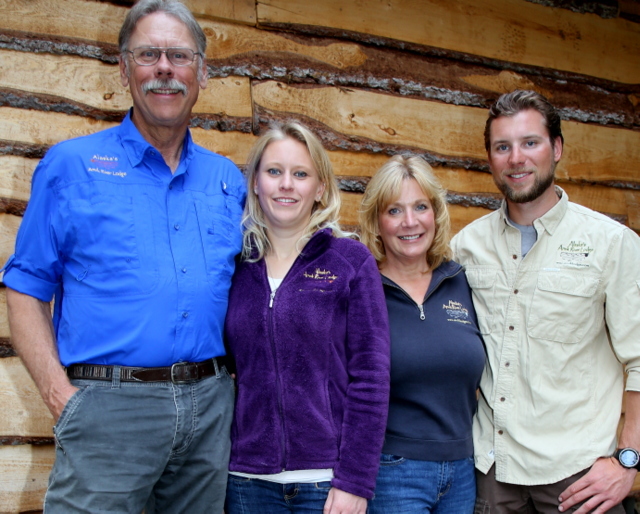 Our family is now celebrating our 23rd season at the most remote lodge in Alaska. We’ve come a long way! What a great story Blair! Your parents raised you right! you two guys should write a book. love all the 14 trips up there. Thank YOU for writing . You and your family have experienced a life that few could duplicate. Lois and I truly had a great time with the ARL expirence. I check FB often for a new blog , keep them coming. Thank you for writing your story. You and your family are wonderful people and fabulous friends. The remarkable place you have created has brightened my life and lifted my soul. Normal is an ill defined socio-mathematical fiction not a measure one should aspire to. There is no joy in normal. You are special. Stay so. Loved the blog! Enjoyed knowing you in your teen years and during my trip to Anvik Lodge. Keep living the good life! I loved your blog! Also enjoyed knowing you in your teen years and my trip to Anvik Lodge. Keep livin’ the good life! Made me cry Blair… you were and are an amazing man and I feelvery proud to possibly have left you with a little nugget of wisdom or two. Thank you and your family fir providing many wonderful memories. Please keep me on your posts. Fantastic story! 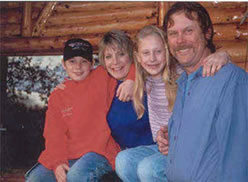 We remember fondly our years in Bethel (1992-1999) and so enjoyed knowing the Hickson family. Our daughter was in the same class with Alyson. Pat Smith You guys are always top of the list when I tell AK stories. My facebook rainbow banner came from your place on the last Alaska hunt I shot 6 years ago. Our first visit had a 20 minute Yupik prayer before dinner, Blair running around with his bow, a front porch brown bear, and a very young Alison showing us all of your cd’s. As she was flipping through them, naming the off, she flips past Jimmy Hendricks and says, “and that’s the one my mom eats fire to”. We go, “Wait! Back up”. She then gets Cheryl, who shows us that yes, that is the cd she eats fire to. I guess it all seemed normal to the kids, but it was pretty magical for us whenever we were invited out. Thanks so much for the great memories Pat. We miss seeing you and hope you’re all well. Much love from the Hicksons. Loved your article. One of the best highlights of my life was our trip to Anvik River Lodge. It was on my bucket list and I wish I could go back again to enjoy the fishing and the company of your wonderful family and staff. Unfortunately as I age I have physical limitations that currently keep me away. If I can overcome them I would be up there next summer and probably yearly. Nice job. I taught you second grade in Bethel. Meghan Maloy has kept us up on the lodges progress.Keep up the good work. Great story thanks for sharing. Our time with y’all this summer was the highlite of our Alaska trip . Your a wonderful person with awsome parents.